founded by Neda Darzi in 2010. Persbook Art is committed to introducing professional and emerging Iranian artists around the globe and to inspiring people who share a love for arts. We represent artists whose art indicates their personal expression as well as their Iranian heritage. Moreover, through this visual communication we share our own insight and passion with others. 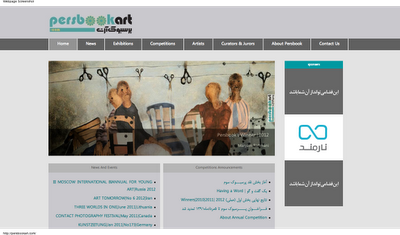 We invite our viewers to transcend the boarders of mind and to use Persbookart as a bridge to appreciate Iranian artists. show their works in a number of art galleries around the world. Besides holding an annual competition we sell artworks to support participants. a- Edward Lucie-Smith: Edward Lucie-Smith’s name and his published work have undeniably affected the introduction of today’s art in the Middle East. With that in mind and in appreciation of your literary work, Iranian Contemporary Art Group invited him as the primary director of the committee members of Persbook Art (Persian+ Art book) competition. His presence as a mentor next to the new generation of Iranian artists will undoubtedly affect the validity of this act and will continue to influence this visual movement in the media. It would be an honor to have him with us on this route. Regarding directing our committee Smith says: "I am deeply honored to be asked to serve as the primary director of the Persbook group. The flood of entries for the competition, the high quality of the submissions and the boldness with which the artists spoke astonished people both inside and outside Iran. The competition had two themes. First, it was about the importance of Iranian contemporary art in the spectrum of art from all over the world. Second, it was about the determination of Iranian artists to express themselves freely and fully. Iran possesses an extremely ancient culture. The artists did not forget their roots, but they were also determined to offer a truthful picture of the human situation as it now exists. They sent a message to the rest of us by the very fact of their participation. b-Neda Darzi: Darzi is a multimedia artist and the Founder of Persbook. By combining some of her original Tapestry, ceramics, and photographs, she has created conceptual video installations, which reflect Iranian culture as well as her own identity. Darzi states, "My interest in video installation is the creation of a simulated experience. The archiving of information and imagery is much like memories I have collected from my past and childhood. Despite the tactility of my tapestry sculptures, the projected moving image requires only the act of watching from the viewer. Unlike sculptures that are within the physical space of the viewer, directly interacting with them, video installations are imitations of reality. I am interested in combining these two media, in order to engage the viewer both physically and virtually.” Darzi has held 8 solo exhibitions and taken part in more than 47 group shows in Iran, France, Italy, Spain, Turkey, Romania, Finland and Greece. Most recent screenings of Darzi ’s videos include: Cologne OFF 2011: (Video Art in Global Context Nomadic Festival Project) at Arad Art Museum in Romania, and Athens video art festival. C-Mahshid Modares: is an artist and art historian born in Iran. She is the author of several articles focusing on the Iranian painting during the Qajar Era, which are published in art history journals in Canada, U.S. and Iran. Her M.A. Thesis tilted Qajar Painting in the Second half of the Nineteenth Century and Realism was nominated for the Outstanding Thesis Award in 2006 in San Jose State University. Currently, she works as a researcher and teacher in San Jose, California.